White paper on crime 2001 Part 1/Chap.2/Sec.3/1. 1. 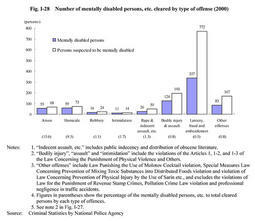 Trends in offenses committed by mentally disabled persons, etc. According to Criminal Statistics by the National Police Agency, among 309,649 persons cleared in 2000 for penal code offenses excluding professional negligence in traffic accidents, 711 were mentally disabled persons and 1,361 were persons suspected to be mentally disabled (these persons are hereinafter collectively referred to as "mentally disabled persons, etc. "). Thus, mentally disabled persons, etc. represented 0.67% of persons cleared for penal code offenses excluding professional negligence in traffic accidents. Fig. 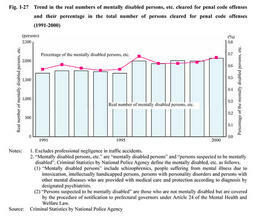 I-27 shows the trends in the actual number of mentally disabled persons, etc. and the proportion of mentally disabled persons to the total persons cleared for penal code offenses excluding professional negligence in traffic accidents over the last decade from 1991 to 2000. The percentage of mentally disabled persons, etc. stayed around at the 0.6% level. Fig. I-28 shows the number of mentally disabled persons, etc. cleared by type of offense. Those who committed larceny, fraud, and embezzlement (including misappropriation of lost property) accounted for the largest share, 53.5% of the total of 2,072 mentally disabled persons cleared. From the perspective of the proportion of mentally disabled persons to all persons cleared for each type of offense, arson and homicide had a significantly large share (15.6% and 9.3% respectively).